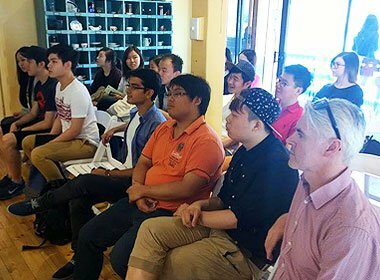 Recently our Adelaide Bachelor of Business (International Restaurant Management) students were entertained and informed on an industry workshop day out to visit some of Adelaide’s newest and most respected establishments. Chef’s and owners of these innovative restaurants and café’s were able to share their business ideas, successes and market insights with Le Cordon Bleu students on a tour organised by Dr Roger Haden - Manager, Educational Leadership and Susie Chant - Senior Writer / Academic Project Manager. Restaurants visited included Orana where Chef Shannon Fleming explained the ethos of modern Australian cuisine behind the restaurant’s success before moving onto Jamie’s Italian where head Chef Nick Filsell gave a menu briefing as well as a pasta nutrition lesson. At Sean’s Kitchen, Restaurant Manager Chad Hanson gave students an inspiring lesson in management of a restaurant, while at the funky Peel St restaurant fine wine and food was sampled. Udaberri co-owner Rob Dinnen also spoke to students before they visited Kutchi Deli Parwana. Finally the day ended in the East End where some great Australian wine and coffees were sampled at East End Cellars, Exchange Speciality Coffee, Sad Cafe, T2 and Hey Jupiter. Le Cordon Bleu students, Roger and Susie would like to thank all the owners, head chefs and restaurateurs for their time on the day and the extraordinary experience of meeting with real entrepreneurs and innovators in today’s retail and restaurant market.